There's been a pair of smew on Ladyburn lake at Druridge Bay Country Park for a few days now, I was there for a meeting this afternoon and a colleague had seem them at lunchtime. After the meeting I decided to have a look for them myself.....no sign. 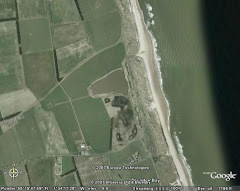 They had probably flown over the ridge onto East Chevington, but what if, a big IF, they had gone a little bit further south....to Druridge? Only one thing for it, I would have to check it out. My first proper post-work birding of 2011, I've missed it, just popping in to Druridge on my way home. Anyhoo, my hunch hadn't paid off, no smew at Druridge. I did have an interesting buzzard, hovering low over NW corner of the Budge field, briefly, before it flew W behind the mounds. It was hovering quite low, with deep wing beets and showed a lot of white in the tail. Oh god, here we go...its that time of year again. Magpies are nice - honest!